This entry was posted in Reading and tagged BookCrossing, books, Henry Miller, Jules Verne, library, reading. Bookmark the permalink. I know exactly what you mean. One day…. I joined bookcrossing in 2005, and have met so many lovely people because of it. I am not as active as I once was, though I go to our local meet up most months, and haven’t missed a UK convention since 2005. I’ve been known to pop along to the Loughborough meet up with friends now and then too. Bookcrossing people are lovely, as you can see from your parcel. Enjoy your books and getting to know bookcrossing. Excellent, keep an eye out on the forums for announcements of this year’s. 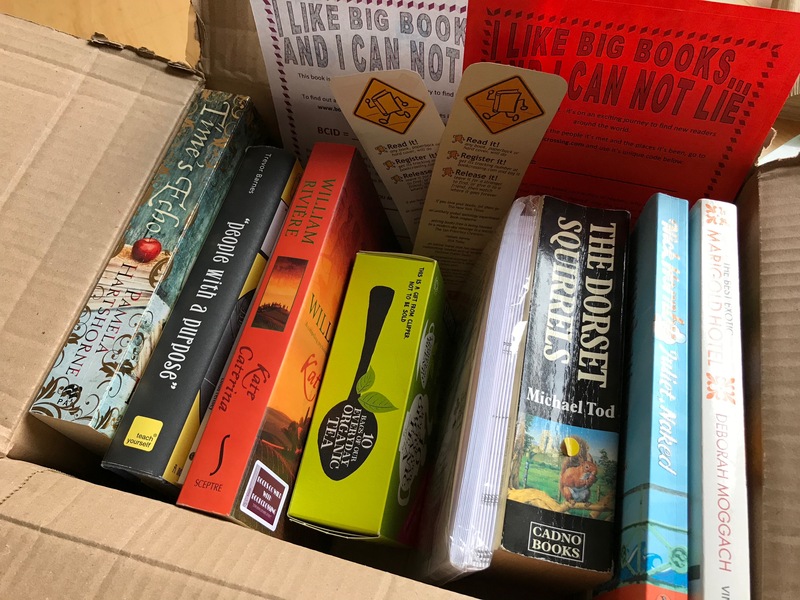 There is also an FB group for Bookcrossing UK. Liz – you continue to astound me on your ability to find the best ways to connect and build a virtual community. This is a great idea. I especially liked the tea that came with the package. Could you write more about this initiative in future posts. Would love to learn more about it. Marvellous, if I didn’t already have hundreds of books waiting to be read I would be in on this!But I will definitely mention it to my friends. Cool idea! And what fun, to get a box of mystery books in the mail! Brilliant! I must look more at this idea. Happy reading Liz! What a great idea! I’ve just signed up, and have sent you a friend request. The tricky bit is going to be finding books I would love others to have the joy of reading, but am prepared to let go! What will your first release be? I’m thinking of doing a random one first off, on a bench in a park or the countryside one sunny day…..
What a brilliant idea! I’ve never heard of this before. Thanks Clare. It was new to me too – surprising really as it has been going for ages. That sounds a great idea. I would like to have a little bookshelf outside near my house, where people can take any they like and put any in they like. There is one , near the train station, I have used before. I love those little bookshelves. I saw a telephone box converted into a tiny library on Facebook – adorable! That sounds fun. I do think I need to ask the council first though…. Ooh that is v exciting!